See more objects with the color grey darkslategrey darkolivegreen or see all the colors for this object. This is a Candelabrum. It was made by Pierre-Philippe Thomire. It is dated 1815–25 and we acquired it in 1999. Its medium is gilt and patinated bronze. It is a part of the Product Design and Decorative Arts department. 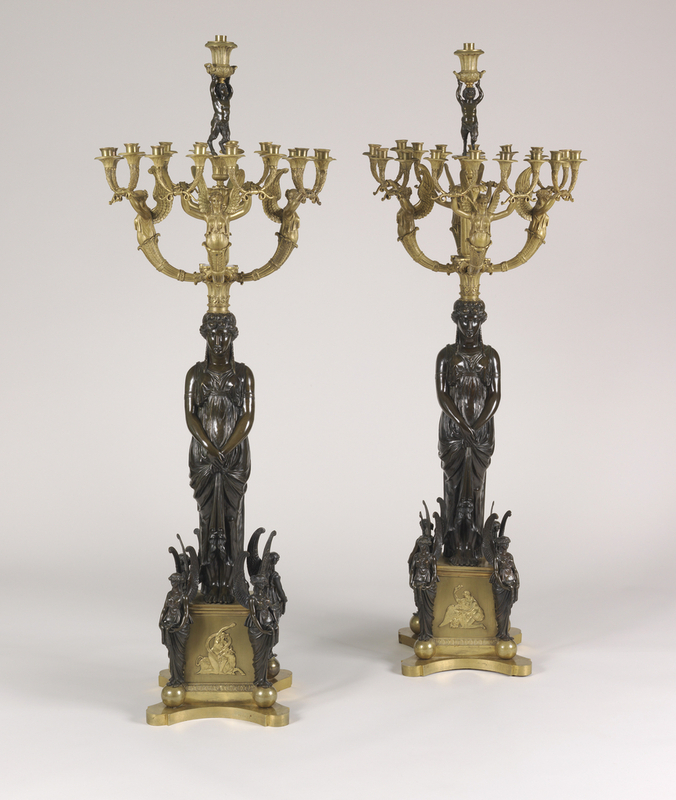 Produced by Thomire, the creator of Cooper Hewitt’s surtout de table, these candelabra exemplify the bronze-maker’s degree of involvement in the design of the whole room and the need for the light produced by expensive and numerous candles. Like architect Charles Percier, Thomire survived from the royal era by rebranding himself with designs favored by Napoleon and Josephine and by maintaining high standards of craftsmanship. This object was transferred from National Museum of American History. It is credited Gift of Annie-May Hegeman.